"Horses don't give each others treats!" One of the arguments I often hear against the use of positive reinforcement in horse training is that it is unnatural “Horses don’t give each other treats!”. Until the recent growth in popularity of “natural horsemanship” this argument wasn’t very popular because after all, nothing equestrians do to horses is natural. Horses may not exactly be giving each other peppermint sweets but they don’t ride on each other back either. The entire argument can very much be dismissed straightaway simply by listing the extensive catalogue of unnatural behaviours, management and training procedures used by equestrians. However for this article I want to do something a little bit different, by pointing out in what ways a training using food rewards can be far more natural than any other, more mainstream, self proclaimed natural ones. Illustration by "Fed up Fred"
1. 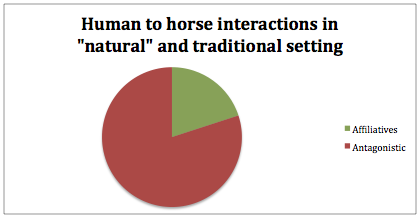 Most horse to horse interactions are affiliatives. Humane, science-based horse training and natural horsemanship both claim to derive their training strategies from observations of natural behaviour of free-roaming horses. Yet the first believe in the use of positive reinforcement and the other doesn’t. How is this possible? High-profile practitioners of natural horsemanship have based their training on two things: personal observations of agonistic behaviours in horses (and rushed deductions.) and misinterpretation or cherry picking of scientific data such as Schelderupp-Ebbe ‘pecking order’ or Konrad Lorenz’s book on aggression both of which were contradicted later on when animals were studied in their natural environment rather than in captivity. 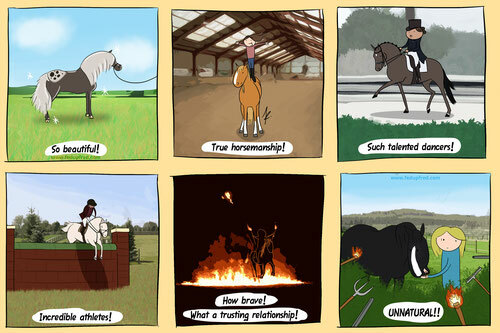 Not only does natural horsemanship focuses on outdated (eg. pecking order) or misinterpreted (eg. dominance) concepts but in it’s mislead focus it lost most of the picture: While antagonistic interactions do exist between horses, they aren’t the norm. 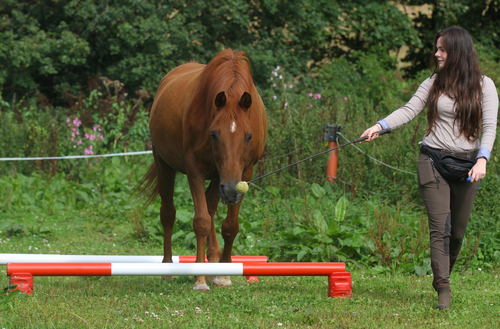 Therefore a training based on the use of aversives (negative reinforcement and positive punishments) does not reflect how horses naturally interact between each others. Yes horses may pins their ears at each other, kick and bite but those behaviours are nowhere as prevalent as resting and grassing together, nursing, playing, grooming etc. So of course adopting training and management techniques, which promote affiliative interactions, is far more natural than a programme, which instructs horse owners to mimic antagonistic behaviours such as chasing. Leardership is another poorly understood concept in animal behaviour. Initially it was thoughts that a single individual (known as the lead mare) decided of the group movements but newer studies found that this isn’t the case. Instead any herd members can initiate group movement. In female horses, movement is simply initiated by departure. The lead horse doesn’t threaten, chase others or force them to follow and horses with the most “friends” are also more likely to be followed than the more dominant horses. Therefore procedures such as ‘join-up’ which tell horse owners to first chase their animal to get them to follow them aren’t derived from natural behaviour but purely from human misinterpretation. 4. Horses learn through positive reinforcement just as much as through negative reinforcement. How we train horses is not a human invention. The ropes and pens may be but the laws of learning are the same in the wild as they are in the barn. They are part of nature, just like gravity, believing in them or not don’t stop them from affecting you. Horses are born with the capacity to learn through several processes one of which is known as operant conditioning and along with classical conditioning is one of the most used learning processes in the equestrian world. At the barn: The rider pulls on the reins (aversive stimuli), the horse stops, the rider let go of the tension on the rein. The horse is learning through negative reinforcement. In the wild: A horses pins his ears (aversive stimuli), the other horse moves away, the horse stops threatening him. The horse is learning through negative reinforcement. At the barn: A horse approaches a human and is given a carrot (appetitive stimuli). The horse is learning through positive reinforcement. In the wild: A horse approaches another horse and they engage into a mutual grooming session (appetitive stimuli). The horse is learning through positive reinforcement. Both types of reinforcement are natural but of course something being natural doesn’t necessary make it ethical. And when there is no need to apply aversive stimulus to obtain a desired behaviour (because positive reinforcement works just as well) one must beg the question… why? Bourjade M, Thierry B, Hausberger M, Petit O (2015) Is Leadership a Reliable Concept in Animals? An Empirical Study in the Horse. Davidson, N. and Harris, P. (2002) Nutrition and welfare. In Waran, N. (ed.) The Welfare of Horses. Kluwer Academic Publishers, Dordrecht, The Netherlands, pp 45-76.